200k Following Bing n Grondahl incentive on TWITTER! Hi there readers I hope as always that your all safe and well no matter where you maybe after a recent conversation with my wife I was humbled to hear to all my hardworking late nights haven’t gone to waste and Debbie has said a 200k Following Bing n Grondahl incentive was her way of saying she’s proud of me. Ive been on twitter now for over three years I gave the format a chance as the popularity of Facebook started to hinder as their algorithm rules and became ever more stringent with them dictating what Is posted in groups set up by the likes of friends of mine, Facebook would see this as spamming and block the post, all I’m trying to do is get NON SELLING relevant articles to the many thousands of followers we have there. 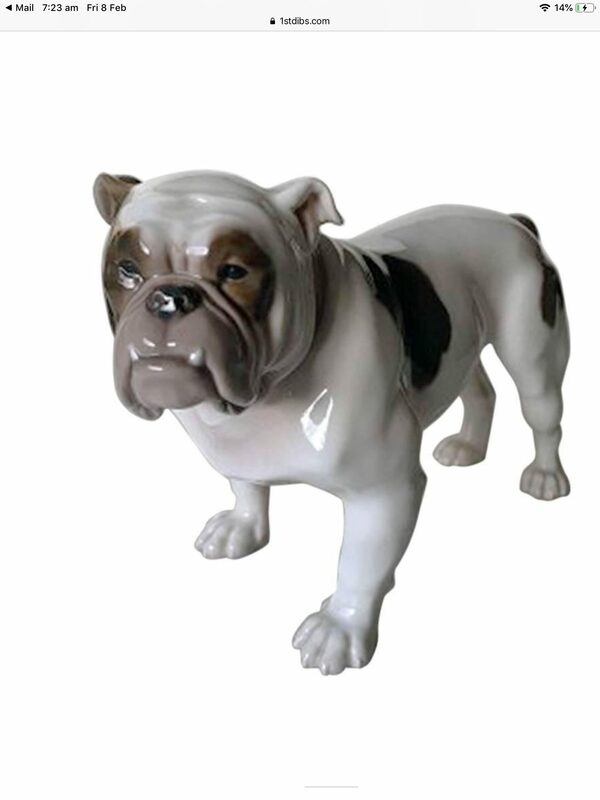 This 200k Following Bing n Grondahl incentive is definitely worth the time and effort finding another three thousand followers and after that as promised I get the bing n grondahl piece, one of a few left from Royal Copenhagen to add to Collectibulldogs, boosting our Danish sub section and it’s also a beautiful display piece. With still no honeymoon this statue will represent the love debs has for me and it’s her way of patting me on the back I do not expect a bulldog antique every time I reach a milestone and this compromise set me aback but I’m not going to say no if all I need to go for is a 200k Following Bing n Grondahl incentive has captured my intrigue and I hope my mutuals can help. Twitter is a very fast format some days it can leave you feeling ill and other days you have great conversations, verified stars and celebrity’s see your page and follow plus everyone is just that little bit more approachable especially as everyone has name tags and you can hashtag anyone these days. My issues are with retweets the disappearing of folk for a while when I’m trying to grow my page not just for me but folks do not see the fact that if you have more followers that’s more eyes  on their posts when we retweet, the posts are cute and do get retweets yet this tends to make promotions about Collectibulldogs harder as most just want to retweet wiggles. With a 200k Following Bing n Grondahl incentive it still won’t stop poor retweets I’ll have to work on this even get in a social media manager just to give me a break and others may know how to best move our content, I try with pics funny home made videos clips of wiggles and even the collection, there is nothing else quite like us on any format we all know that. There is a small core of collectibulldogs retweeters im not sure why so many only post wiggles if people were kinder we could use our metric reach to get our posts out further yet it’s not easy where as when I post to Facebook it’s liked shared and even commented on, I understand people may not be interested in my venture but folks residing in their page might. The Figurine aside all bills are paid out of the money I got that caused me to end up with mental health issues I cannot afford advertising it’s why you see me online so much ! I’d love to be able to sort out other problems in my life but it does feel most of my time is now online. For the time I spend on twitter it’s definitely not worth the view count but as I hardly get any interest on my Facebook profile I’m drawn to twitter even if just to say hi to people, I can get nasty and lose the plot but that’s only when I see Labour supporters that believe all bulldog owners are into white supremacy as I’m getting blocked by my own fellow supporters not lots just enough for me to notice prejudice and or stigma depending on why they are blocking. maybe once they have read this they may understand that in the morning my wife retweets for me so it’s me ignoring anyone’s tweets my wife doesn’t know my mutual retweeters so that’s a totally innocent  explanation to the morning routine, but to make it Crystal clear I’d like to say sorry for any inconvenience and I hope that we can stay as mutual retweeters. From Jude haste a brilliant author and mental health advocate and follow help like GansyMan, to kickass cantona (Eric) a football mad friend I’ve made for life on twitter and all those that are normally there to send my posts out I hope that 200k Following Bing n Grondahl incentive the article gives you an idea on why my twitter pattern changes and I do want that bulldog figurine. For a site like ours tho hundred thousand is plenty it’s the quality over quantity though and that’s why I’m now writing this so my twitter pals give me a reprieve and even offer to support the venture and share our posts, we would love to see much more interest coming from the Twitter format on the Google analytics, the more that post our Collectibulldogs articles the further our reach we have no issues retweeting others articles so please help and give us a chance. If you look at @collectibulldog on #Twitter you’ll see eiffion will be getting this incentive earlier than expected he’s nearly hit a target of two hundred thousand followers one of the reasons I want him to continue! Help me support eiffion just comment share spend time checking out the articles it all helps !